In this tutorial, you'll learn how to make greeting cards with pockets that can be filled with little pieces of your creative art—artist trading cards (ATCs), bookmarks, little folded cards, tiny books and more. They are also ideal for presents of money or gift cards. 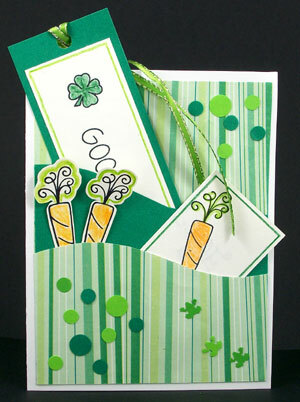 These pocket cards are very versatile: make several in a variety of colors to have on hand to decorate for any occasion. 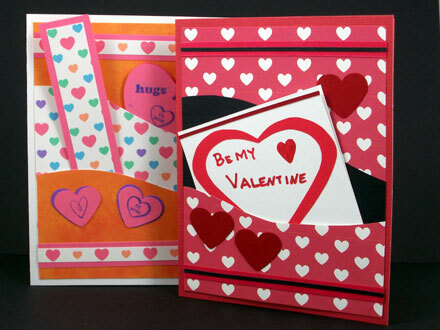 For Valentine's Day, fill the card pockets with Valentine messages and tokens. Do the same for Mother's Day using Aunt Annie's special Mother's Day project extra. See card ideas in the sidebar. 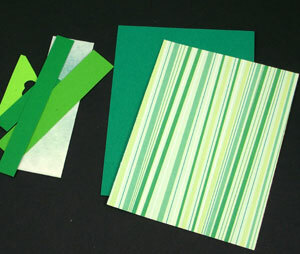 This greeting card tutorial builds on the previous tutorials, especially #1: Four Patch Cards and #8: Bookmark Cards. 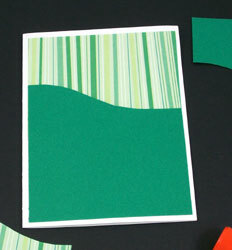 If you are new to card making, review those tutorials before starting this one. Optional: Paper punches, rubber stamps. 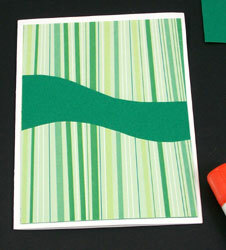 This tutorial is eleventh of twelve card-making tutorials and is rated AVERAGE to do. 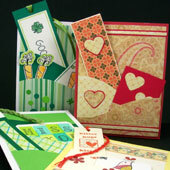 The card front is composed of two pockets cut from coordinating plain and patterned paper (or cardstock). If you have something in mind to put in the card pockets, select colored paper that will combine well with that item's colors. 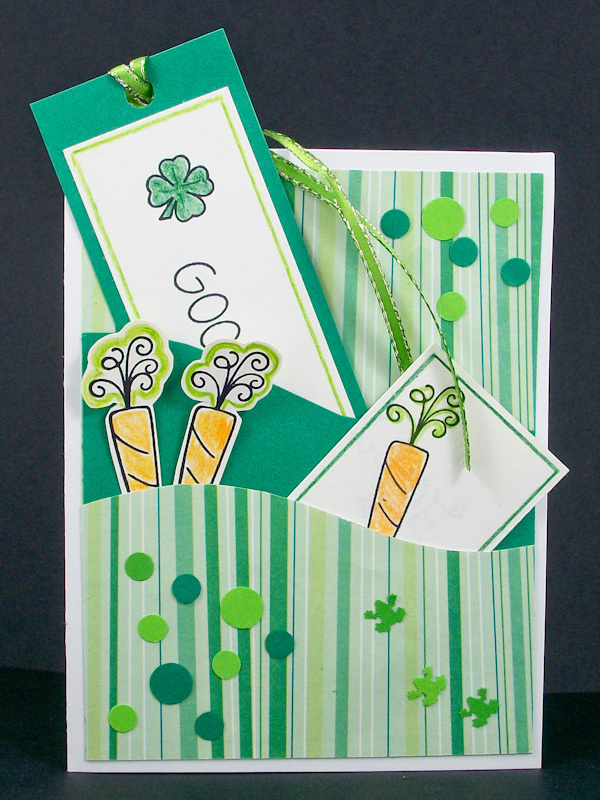 To make the pocket item the focal point of the card, be sure that the paper colors contrast with the item in color or value (lightness and darkness). 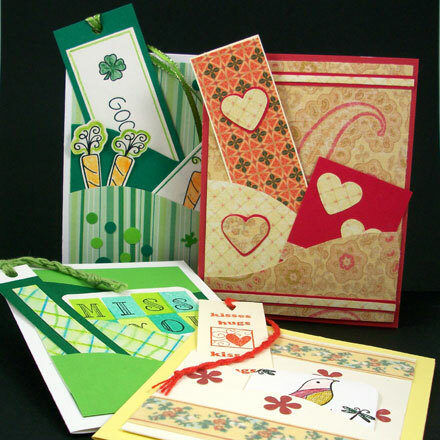 Also, gather paper scraps and leftovers in the same colors to use in decorating the card or making items to put in its pockets. 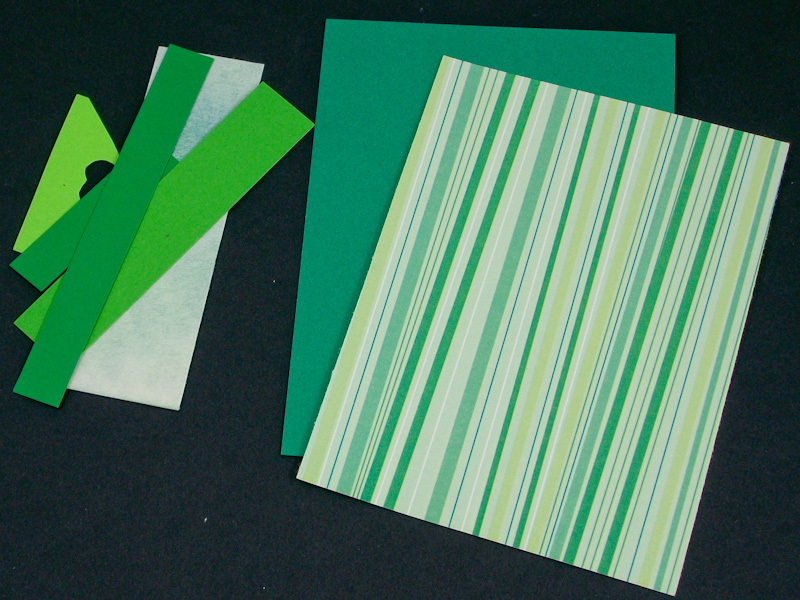 Tip: If you are new to making cards, stick to two papers that are the same color. 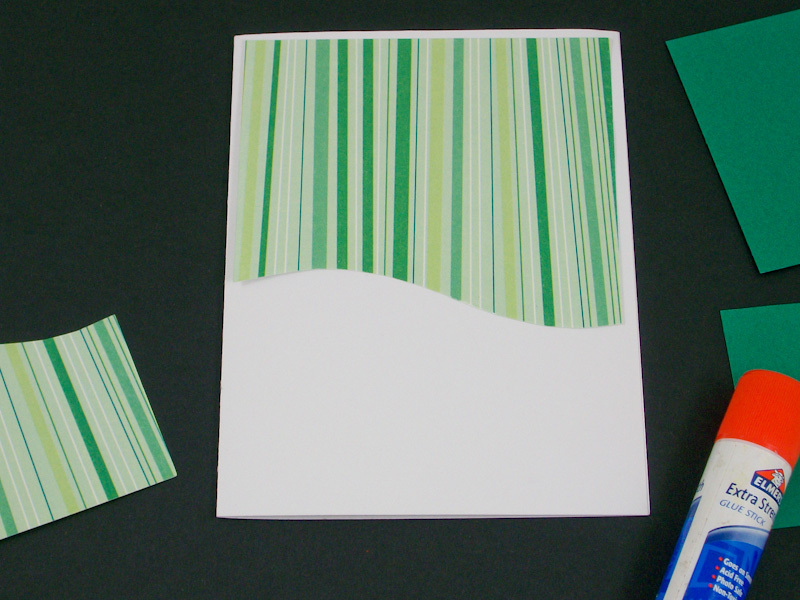 For more about color selection, review tutorials #2: Matted Clip-Art and Photo Cards and #6: Paper Weaving Cards. 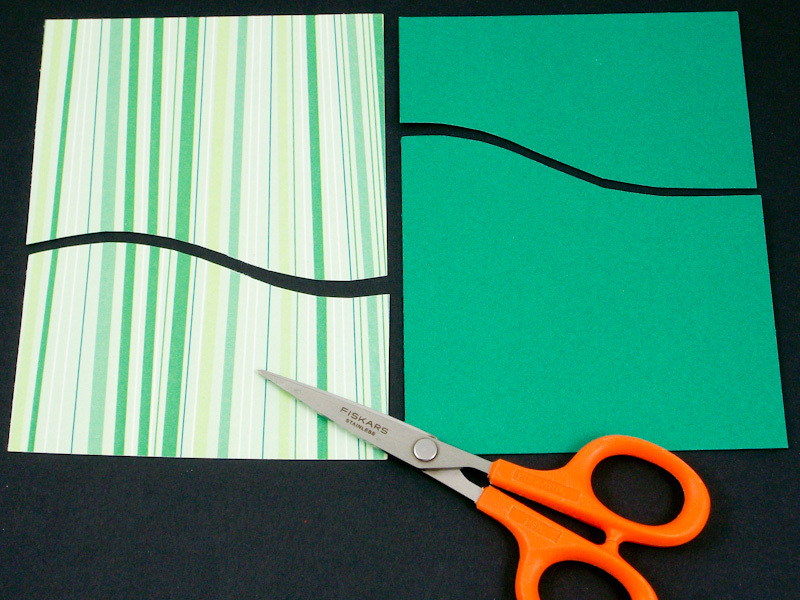 Cut a 4" by 5¼" rectangle from each of the two card papers. One of the papers will be cut for the card background and smaller pocket, and the other for the primary pocket and an optional inside pocket. 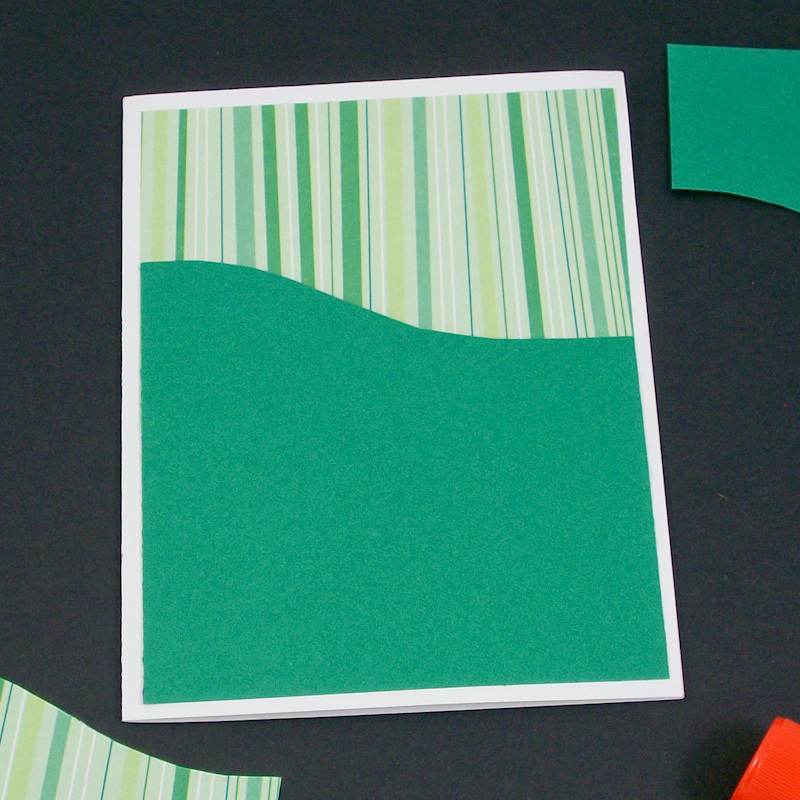 Cut the background paper in two, making a curved cut around 2½" to 2" from the bottom. 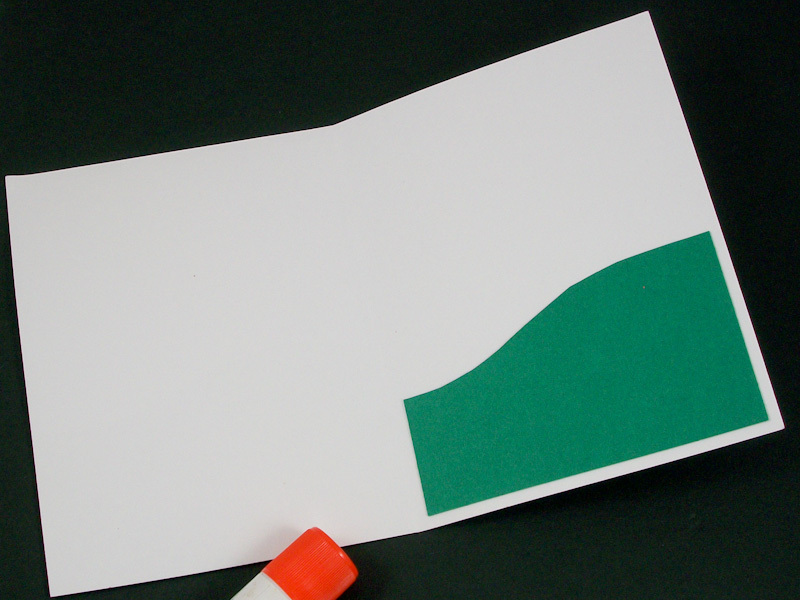 Cut the other paper in two, with a curved cut around 3½" to 3" from the bottom. 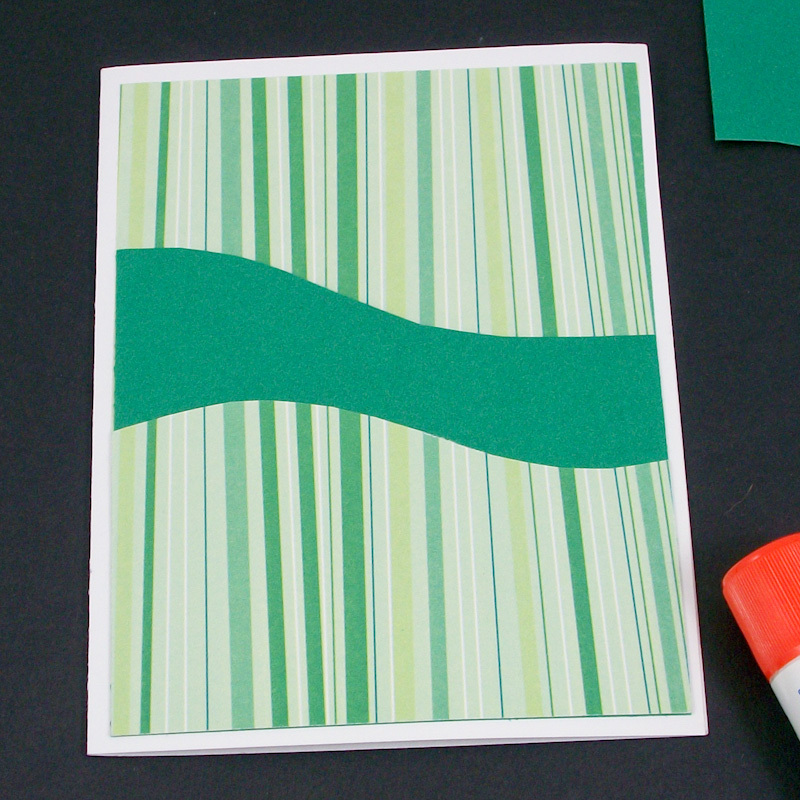 Glue the top part of the background paper to the top of the card with equal margins on the left, right and top. 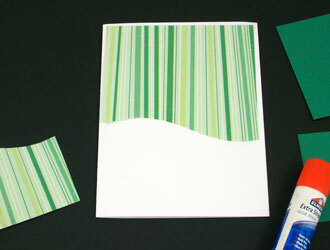 Glue the bottom part of the other paper to the bottom of the card, making a pocket by applying a narrow band of glue to the left, right and bottom. Be sure to leave the top open, and align the sides with the background paper. Glue the bottom part of the background paper on top of the first pocket to form a second pocket. Apply narrow bands of glue to the left, right and bottom, and align this pocket with the sides and bottom of the first pocket. Optionally, add a pocket to the inside of the card by gluing the remaining piece of paper to the bottom left or right of the card's inside. If you like, decorate the pockets with paper punches, rubber stamps or stickers. 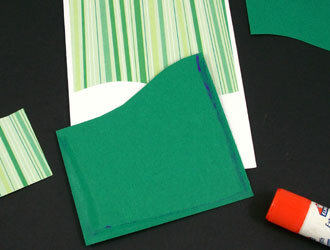 Make items to fill the pockets, like bookmarks and little folded cards. 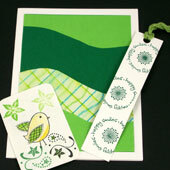 The card's greeting can be stamped or written on the bookmark, or inside the little card. Use your creativity to make the card special. 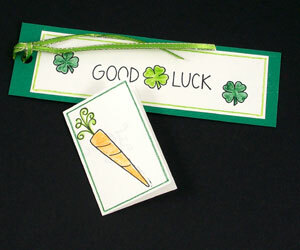 Tip: For ideas on making bookmarks, see the Punched Bookmark project or #8: Bookmark Cards tutorial. 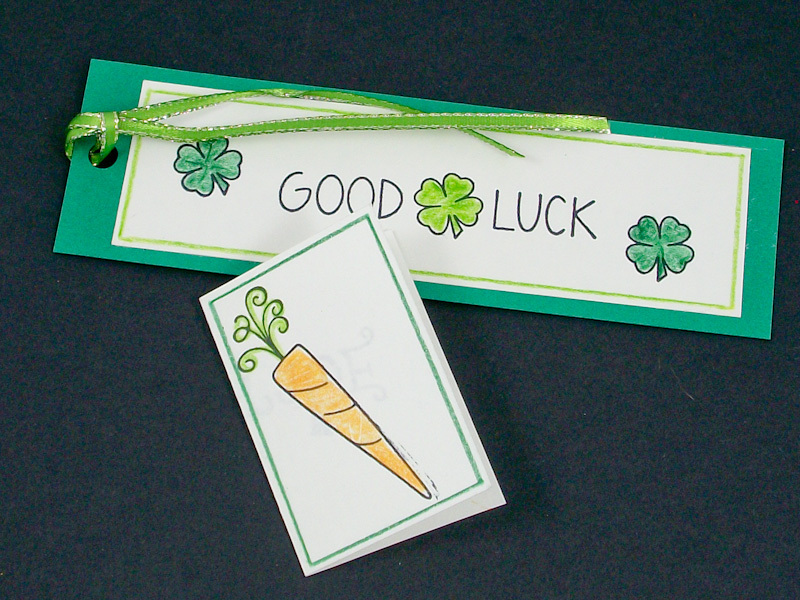 Tip: Decorate the backs of the bookmarks and little cards with stamped images. Color them to match the card front. 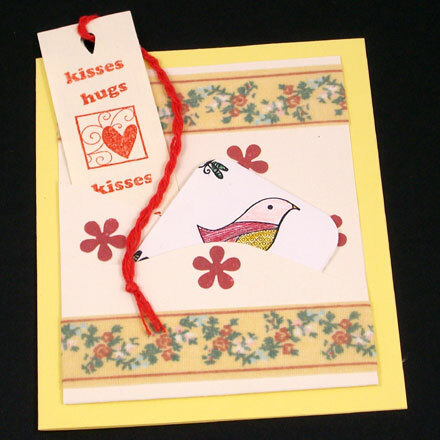 Tip: Use Aunt Annie's Mother's Day stickers and tags to make pocket greeting cards for Mother's Day. 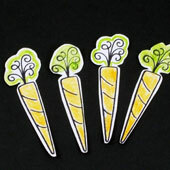 The stickers are for decorating the pockets or items to put in the pockets, like bookmarks. You can also make mini-cards for the pockets by adding a special message for Mom inside a folded tag. 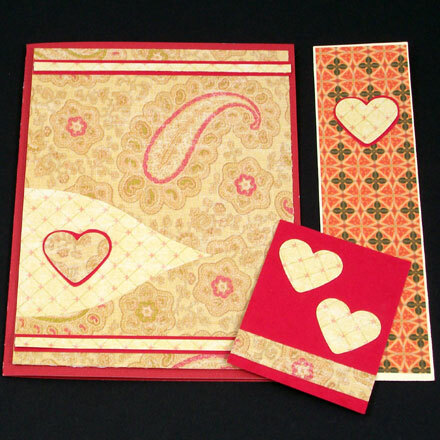 Tip: Use Aunt Annie's Pastel Hearts, Little White Hearts on Red and Small White Hearts on Red ePapers to make pocket greeting cards or other card. Tip: Use the heart ePaper as the background for a pocket card or for the primary pocket. 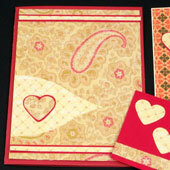 For the details on making these heart ePaper pocket cards, see Sweetheat Cards with Pockets. Tip: Stamp the card's greeting on a little card slipped into a pocket. Tip: To de-emphasize the pockets, make them in the same neutral color. 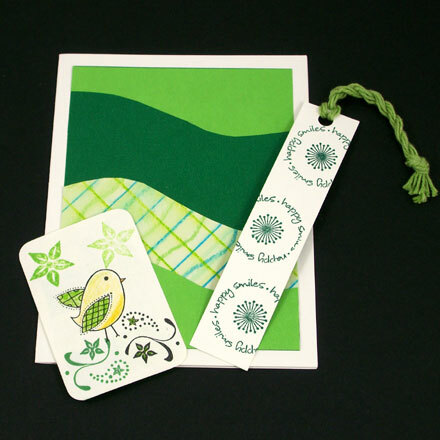 This will result in the other design elements and pocket items being more prominent—like the ribbon and paper punches on this card. Tip: Use double-sided paper to make pocket cards. 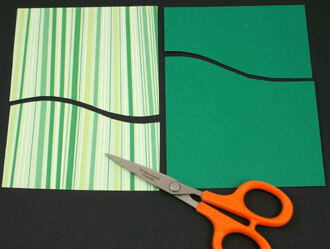 Cut a rectangle 4" by 8¾" to 9½". 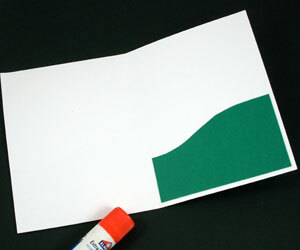 Fold the paper up at 5¼", forming the background and primary pocket. Cut the primary pocket in two with a curved cut. Flip over the portion cut to form the second pocket. Tip: Pocket cards call for whimsy. 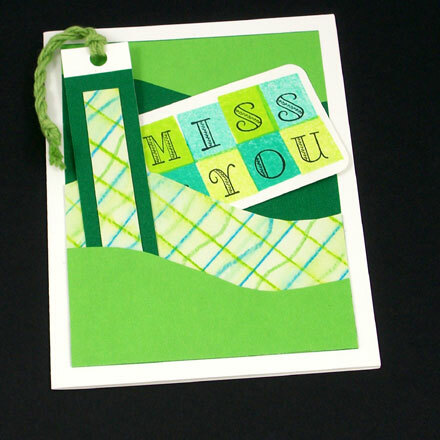 Stamp fun pocket-sized images on white cardstock, then color and cut out.